Expect to pay several thousand dollars for a funeral. 2. Can You Roll Closing Costs Into an FHA Loan? 3. Can an IRA Be Rolled Over to Funeral Costs? With the cost of some funerals running more than $10,000, making arrangements to pay the expenses might be difficult. Typically, funeral directors want payment up front. If no one preplanned the funeral, the family is left trying to gather the money to pay for it at a time of extreme emotional stress. Whether you prepay or pay at the time of service, you have several options on how you handle the financing. Prepaying for your own funeral allows you to make your own arrangements but is not without risk. While some states have laws that protect the purchaser of a prepayment plan, some do not. The Federal Trade Commission recommends that you get a detailed funeral plan from the funeral home that specifies what services and merchandise you are buying. Your contract should contain information about the refund policy, transferring the services to another funeral provider, where the money is kept -- some states require that the provider place a percentage of the money in a state-held trust -- what happens if the company goes out of business and who receives interest on the money, if applicable. You have two choices when it comes to using insurance policies to finance a funeral, life insurance or funeral insurance. Funeral insurance requires you to pay premiums and, upon your death, pays the funeral home for your expenses. Funeral Help Program recommends that you consider what the cost of a funeral will be in the future when deciding on a benefit amount. Assigning the deceased's life insurance policy to the funeral home allows the insurance company to pay for the expenses directly from the policy. Make sure you get an itemized statement from the funeral home and specify that amount as the assignment instead of allowing the funeral provider to receive the full amount and send any remainder to you. The Funeral Rule -- a federal law enforced by the FTC -- gives you the right to receive an itemized price list for provided funeral services and goods. While funeral homes do not typically offer financing plans, some companies specialize in providing loans to pay for funeral costs. Other sources of loans include your own financial institution, credit cards, friends and family. Typically, you must provide collateral to secure the loan if you want the best interest rate, according to Bankrate.com. If you get a loan from a family member or friend, a signed loan agreement can help prevent disagreements regarding the repayment terms. You can save money on a funeral. Purchasing a casket from a casket dealer instead of the funeral home eliminates much of the industry's markup. Except in some cases, embalming is not required by law if cremation or burial occurs soon after death. However, some funeral homes will not allow viewings without embalming the body. Cremations can save you the cost of a casket and burial. No law requires that you purchase a casket if the deceased is being cremated. 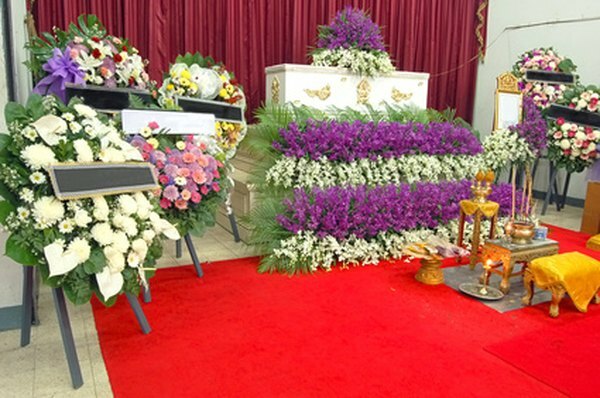 Typically, you can rent a casket to use for viewing during the service. If the deceased is a veteran, national cemeteries provide a free burial and marker, but you must pay for transportation to the cemetery. Is There Mortgage Insurance on a VA Loan?